We’d love your help. 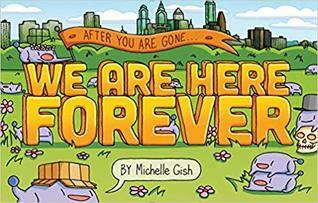 Let us know what’s wrong with this preview of We Are Here Forever by Michelle Gish. After the most adorable apocalypse ever, the human race has vanished from the earth, replaced cute, innocent, playful purple creatures called the Puramus. In this hi A hilarious graphic novel in which the human race has been supplanted by a sweeter, kinder, happier species...but are they as innocent as they seem? In this post-apocalyptic comedy, it's survival of the cutest! To ask other readers questions about We Are Here Forever, please sign up. What can I say? This book is adorable beyond all reason AND it made me question my humanity. What more could you want? Cute and weird and ominous. What more could I ask for? I read halfway through in one sitting, waiting patiently for it to get good, but it didn’t. I have the suspicion that I know a few people who would enjoy it for its odd irreverent silliness- these same people are the ones who have to explain current memes and slang to me.